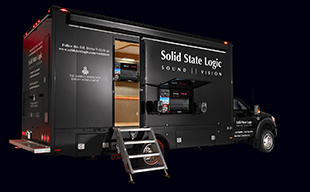 OXFORD, ENGLAND – Solid State Logic, the world’s leading provider of advanced technology for creative audio professionals is proud to announce System T at IBC 2015 (Stand Hall8, D83). Designed from the ground up to provide the power to handle large-scale productions in a ‘multi-platform delivery’ driven future, System T is a new fully networked broadcast audio production environment. A range of hardware and software control interfaces can be placed anywhere on a network with up to three consoles or control interfaces accessing a single or fully mirrored redundant pair of processor cores. Multiple processor cores can be used on a single network. Control interfaces and processing resource can be re-configured to suit daily requirements. Routing and I/O is Dante based with System T featuring the first consoles to use the new Dante HC (High channel) connectivity. SSL’s newly expanded Network I/O range puts SSL audio quality Stageboxes and interfaces wherever they are required in a facility. With Dante reaching the 500 product landmark at IBC 2015, System T has plug-and-play discoverability and interoperability as central principles. System T features a wealth of innovation in technology and conceptual design and delivers the versatility to create previously impossible system configurations and to handle future expansion. Antony David, Managing Director of Solid State Logic commented: "System T is a technology at the beginning of its life - a comprehensive and forward-thinking approach to broadcast audio production that enables broadcasters to plan for the future, and adapt in the future. “Dante has more than 220 licensed partners already and at IBC reaches the 500 commercially available product landmark, and is still growing. It’s a complete technology, with a control and configuration API, so it was the obvious and best choice as the primary infrastructure for the routing and I/O aspects of System T.
The Dante AoIP network, integrating the AES67 transport standard, offers large-scale routing and remote control of a diverse range of Dante-compatible I/O devices. System scaling requires only additional networking switch capacity - not expensive proprietary routing hardware. This makes large-scale deployment extremely cost-effective. A 24-way, Gigabit Ethernet switch, for example, offers the equivalent of a 12,000 x 12,000 TDM router at a fraction of the cost. Proven SSL Network I/O products and bridging technologies (analogue, AES, MADI, SDI) mean that System T will fit anywhere, including in existing traditional TDM-based routing infrastructures. This will allow broadcasters to manage their migration to network-based audio transport and routing without dismantling existing provision and without compromising on audio quality. The Tempest processor core is the heart of the System T mix engine and uses SSL’s patented Optimal Core Processing for real-time, 64-bit CPU-based, floating point mixing and processing. Tempest is the foundation of an advanced broadcast architecture that is built for purpose. Each processor core can handle up to 3072 inputs and outputs and provides 800 fully processed, fully configurable mix paths, 192 mix busses, 800 EQs, 800 dynamics, and 400 delays. Multiple Tempest cores can be connected anywhere on the network (including separate fire zones if required) and used as mirrored redundant pairs or as additional processing resources that can be allocated around the network to any System T control devices. Paths, processing, and routing can be dynamically allocated in real time without interrupting audio - a unique feature in a Broadcast console. A range of System T control interfaces can also be connected anywhere on the Network and incorporate multi-touch and gesture-driven screen technology, hardware control, and intelligent, intuitive workflow. Broadcasters can specify configurations to suit almost any environment, from a large surface with dual operator / dual monitoring provision to remote hardware panels, to SOLSA (SSL’s remote on-line and off-line control application) run from a PC. The System T hardware panels and touch screen driven software environment benefit from nearly 30 years of SSL design research into TV production operation. The overall system architecture innovation of System T is matched by an extensive collection of new operational and processing developments. Additional feature highlights include a large internal FX rack with its own dedicated DSP (plug-ins include: dialogue noise suppression, dynamic and tonal shaping, reverbs, analysers, and signal generators), enhanced Dialogue Automix with nested groups capability, bus-based mix-minus feeds, built-in KVM switching to bring external computer display and control to console touch screens, and much more.